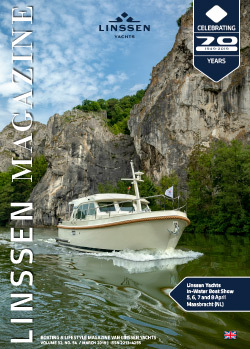 Own you Linssen boat in Europe. Linssen Yachts is one of the few steel motoryacht builders capable of giving the long-cherished dream of many an added dimension. That’s because Linssen Yachts can offer you a special formula: “Own your boat in Europe”. There are countless different ways to interpret a “rural retreat”. But looking at Europe from the inland waterways is an incomparable experience. Anyone who wants to “blow off steam” but give in to his sense of adventure at the same time should choose a steel Linssen displacement boat as his rural retreat. A Linssen yacht is comfortable and offers privacy. You decide where you want to go and what you want to explore, whether it’s a dazzling night out in cities like Paris, London, Maastricht, Amsterdam, Berlin etc. or the tranquillity and endless variety of nature and culture in France, Germany, the Netherlands etc. Whatever you choose, afterwards you can always return to your own, floating domain. And the next day, you, and you alone, will decide whether and how to continue your journey. Whether you’re in the mood for more countryside, the hustle and bustle of the city, cultural sights or adventures along the coast – you take your home along with you to the next destination. We offer you a hassle free way to buy a boat overseas. And if you’re looking for a rural retreat on a boat, then Linssen is the perfect choice. Every Linssen model is a product of exceptional quality. Choosing the right product is naturally your biggest concern, but it’s important to look beyond the product as well. Linssen Yachts has been working for many years to build its network of dealers and service centres at interesting locations in Europe. Our customers frequently entrust their boat to Linssen Yachts’ international partners for period of time when they are not on board or even for a whole winter. This adds a very special dimension to “Own your boat in Europe”. It means that you can follow your dream of months, sometimes years of travel planning, without a care in the world. We are proud to offer you the benefits of owning a Linssen motoryacht in co-operation with trustworthy partners. Service and maintenance comes from the Linssen Yachts network, guaranteeing you fast, friendly service and Europe-wide assistance. In winter, your boat can be transferred to winter storage premises, including craning, internal transport etc. Our network can also take care of winterising and regular servicing. “Own your boat in Europe” is a unique formula that gives you the assurance that your precious Linssen powerboat will always be in safe, reliable hands. Spending some time at home? Don’t worry. One of the Linssen-partners will take good care of this part of your capital... Contact Linssen Yachts and find out how you can live your dream of exploring the European waters on your own boat. It all adds up to a great boating deal and a great way to enjoy sailing around Europe! A Linssen is the perfect powerboat for touring Europe in comfort and style. It combines classic boat design with state-of-the-art performance and uncompromising quality. There is no better way to visit the continent’s best-known locations... and discover some of its hidden treasures. The fact is that Linssen Yachts have been shown to keep their value over many years. Some of our yachts, for example, are worth as much after ten years, or more, as they were when they were new*. Have you decided to end your boating career in Europe? The Linssen Yachts network can help you sell your boat for the best price the market offers! Another reason to buy your Linssen boat overseas. Many people have already fulfilled their dream in this way. Enthusiastic owners from Australia, South-Africa, Canada, Russia, as well as from Switzerland, Great Britain, Germany and the Netherlands are delighted with Linssen Yachts and its network. Why not make use of our fantastic formula? Would you like more information? Contact us to find out about obtaining a “Linssen in Europe”. All your worries will be put to rest. Get in touch with the Linssen Yachts office at +31 475 43 99 99 or by e-mail at info@linssenyachts.com.